I am finally back from vacation, so it’s time to get back to work. 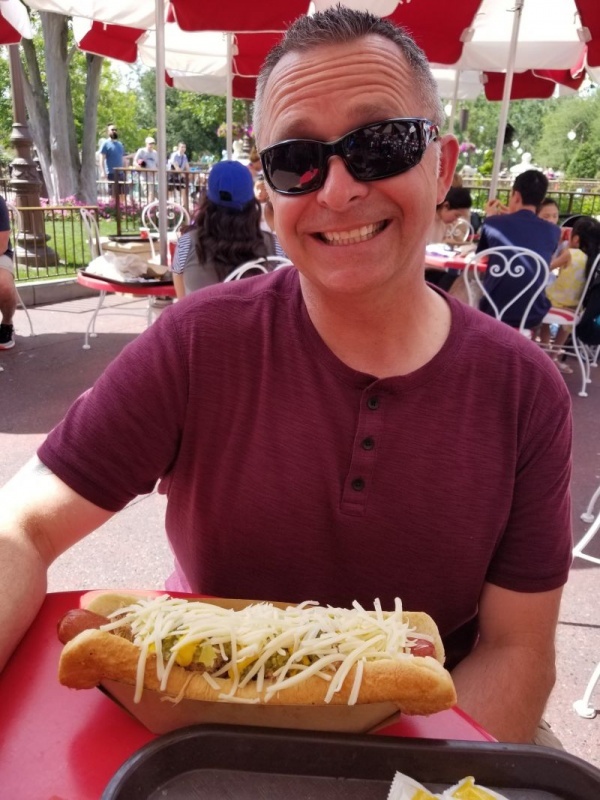 I have just returned from a wonderful vacation to Disneyworld in Orlando, Florida, and Amber is cracking the whip for me to get another post done! 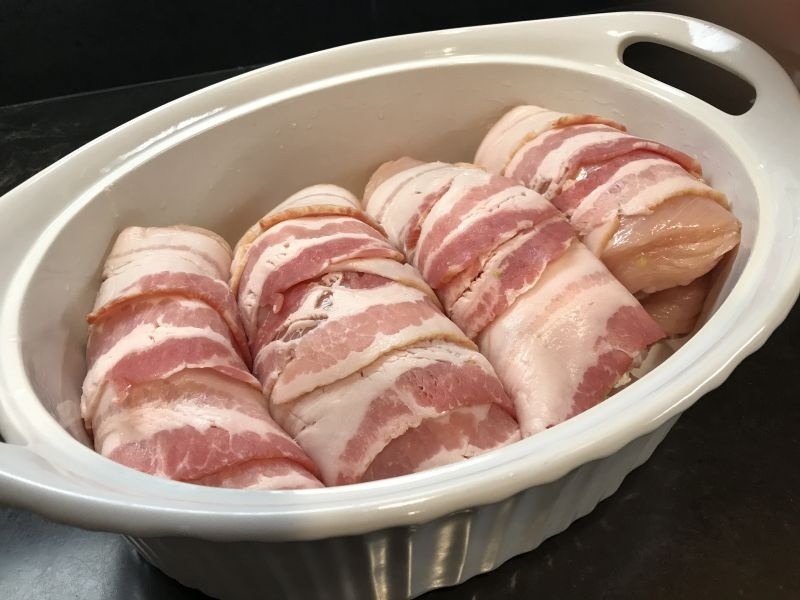 So this week I’m making a dish of bacon wrapped chicken. Amber comments: Get back to the kitchen! 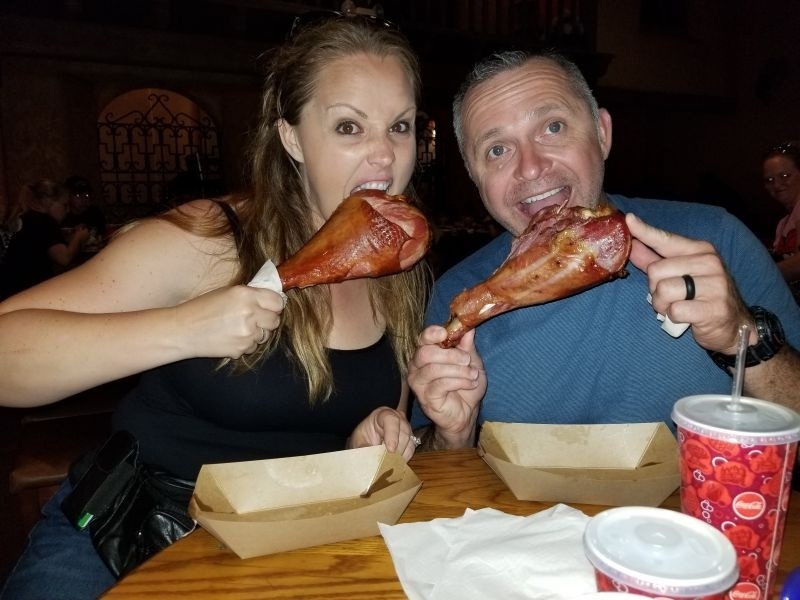 We also enjoyed the most amazing turkey legs in Adventureland, but as you can see, they were devoured by my daughter and her husband. 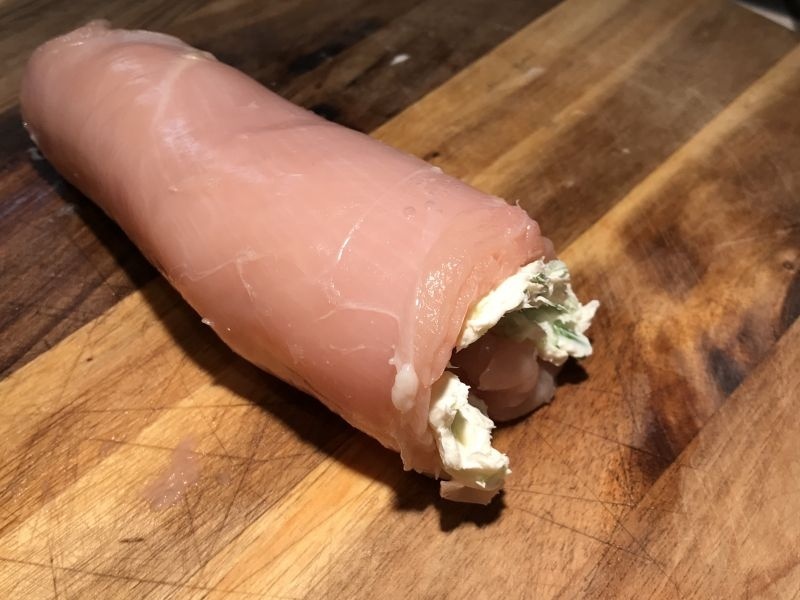 (My daughter did give me a bite, and it was moist and tasted as though it was smoked. It was amazing! Everything was wonderful, and thanks to our fabulous hosts, we had a delightful vacation. 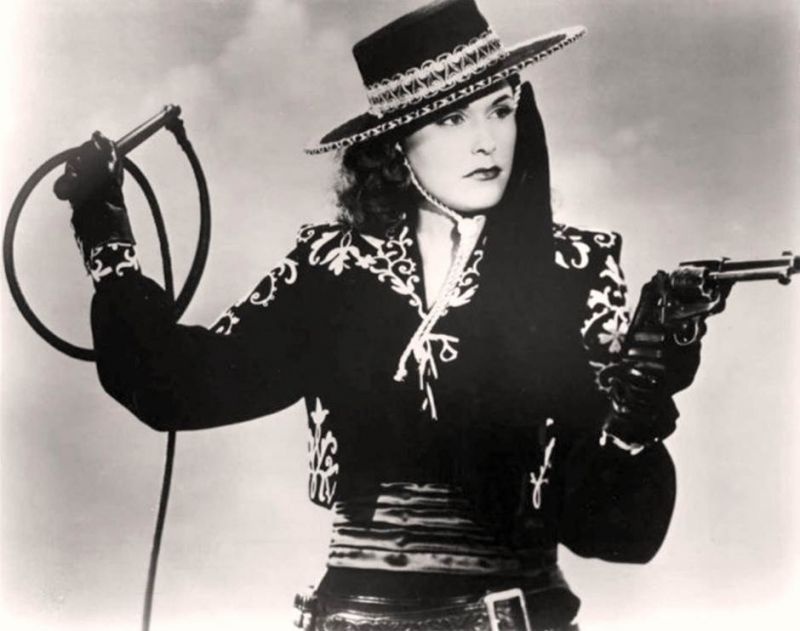 Watch out Clint, she might bite your fingers next! 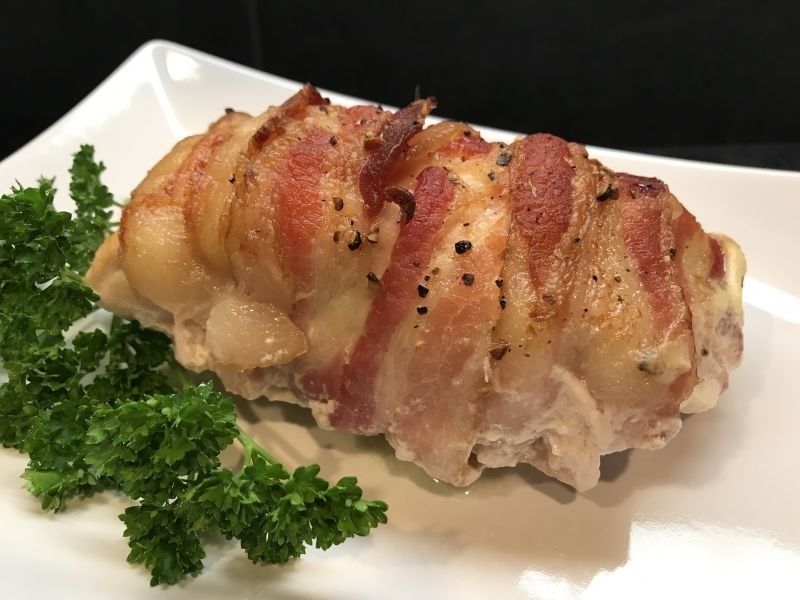 Our first dinner after returning home had me hankering for bacon, and my sweet husband is game for anything wrapped in bacon. Unfortunately, while I was gone on the trip, my husband did not go grocery shopping so it was slim pickings to make something for dinner. Since the alternative was a bowl of raisin bran, I got to work. As it turns out, my husband went nuts over this, and has already asked me to make it a regular dinner rotation! You’re going to need bacon, of course. At our house, that is always in the refridgerator with a backup in the freezer. 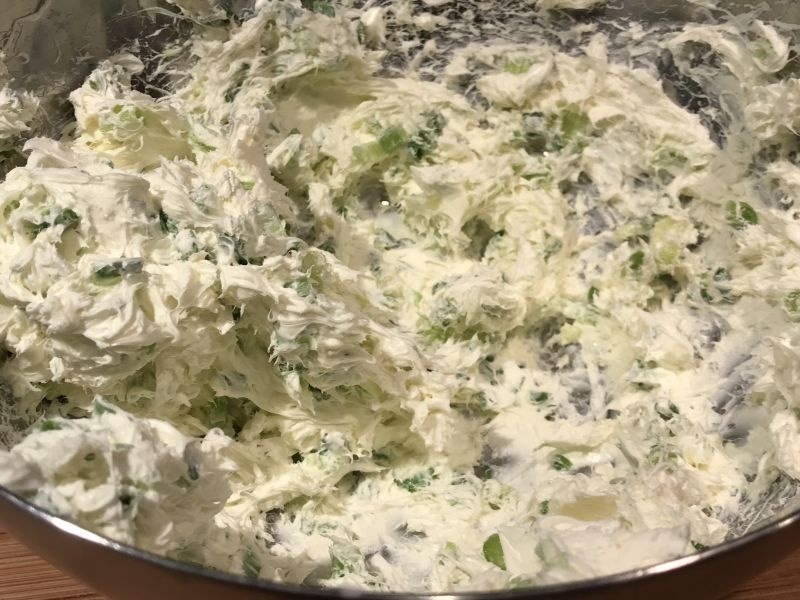 Cream cheese is something else you will need….but enough of that. Let’s get started! 2. Spray a medium-size casserole dish with non-stick spray and set aside. 3. 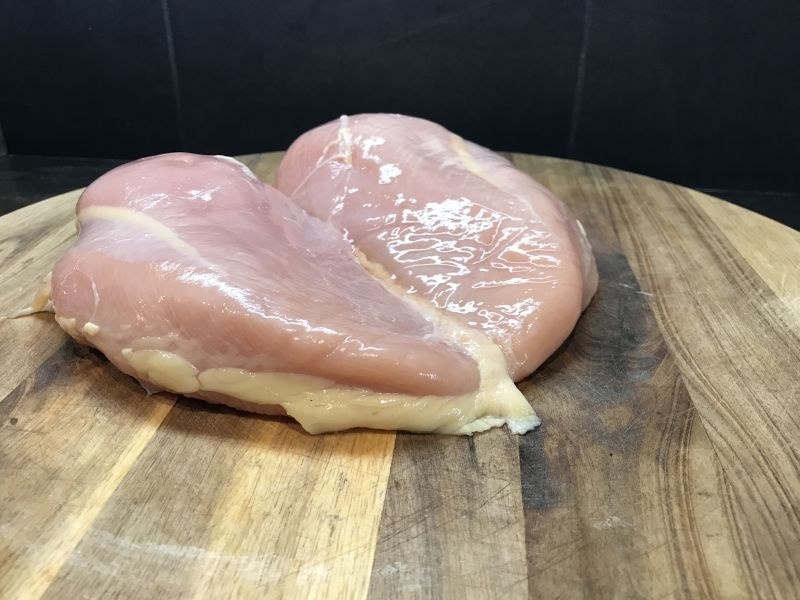 Rinse the chicken breasts in water, and cut in half at the joint between the breasts. This will give you 4 portions. 4. 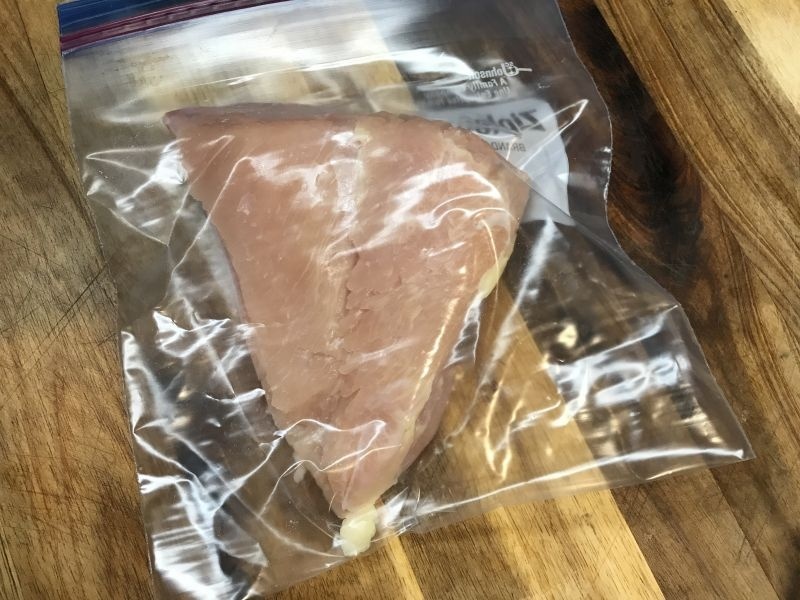 Place one chicken breast inside of a quart sized ziplock back and seal closed, leaving an open area at one end to allow air to escape. 5. 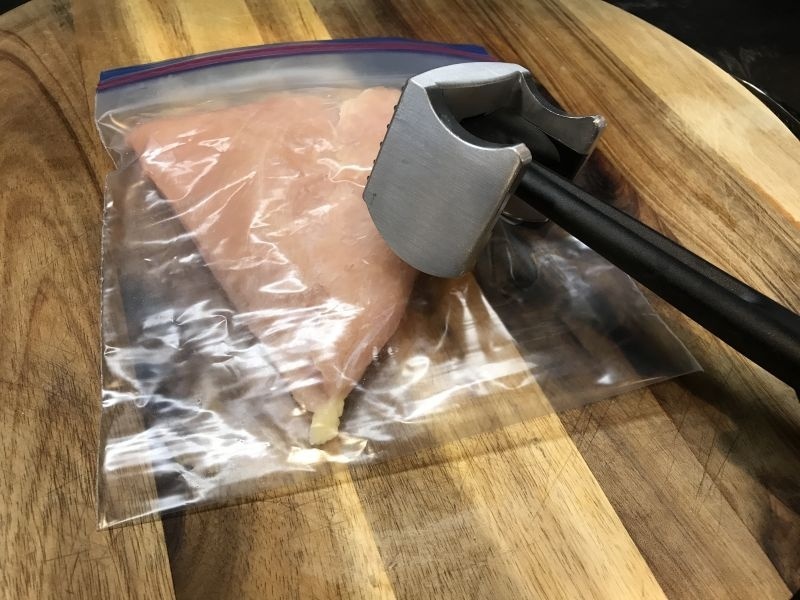 Using the flat side of a meat tenderizing hammer, flatten the breast down to about1/2 an inch. If you don’t have a meat mallet, use the bottom of a cooking pan. It works! 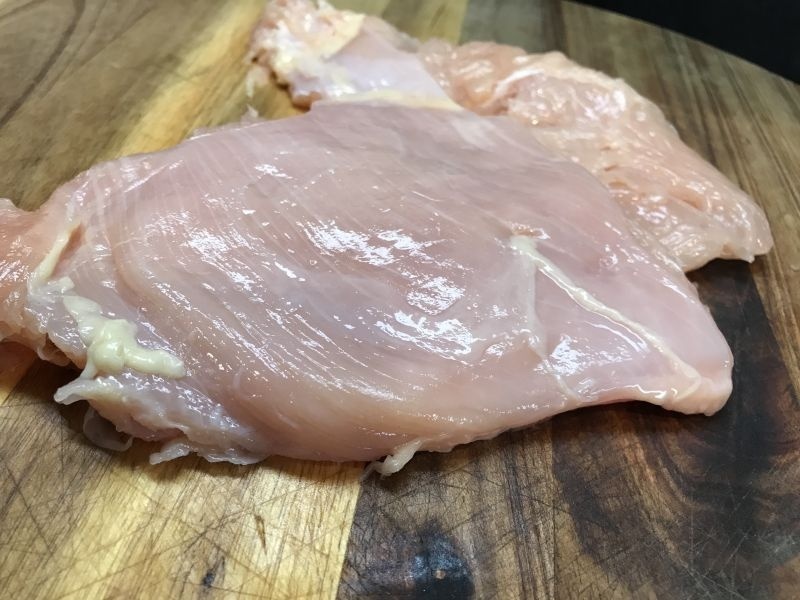 Repeat this with all 4 breasts. 6. Remove from the bags and sprinkle lightly with salt and pepper and allow to rest while you make the filling. 7. In a medium-sized bowl, mix the cream cheese until soft and pliable. 8. 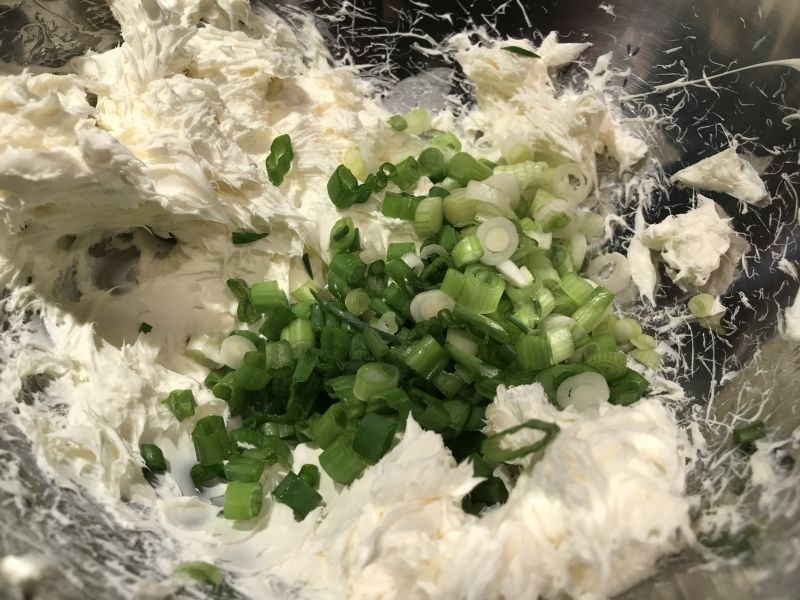 Slice the green onions into thin slices and add to the cream cheese, mixing well with a rubber spatula. 9. Divide the cream cheese mixture into 1/4’s. 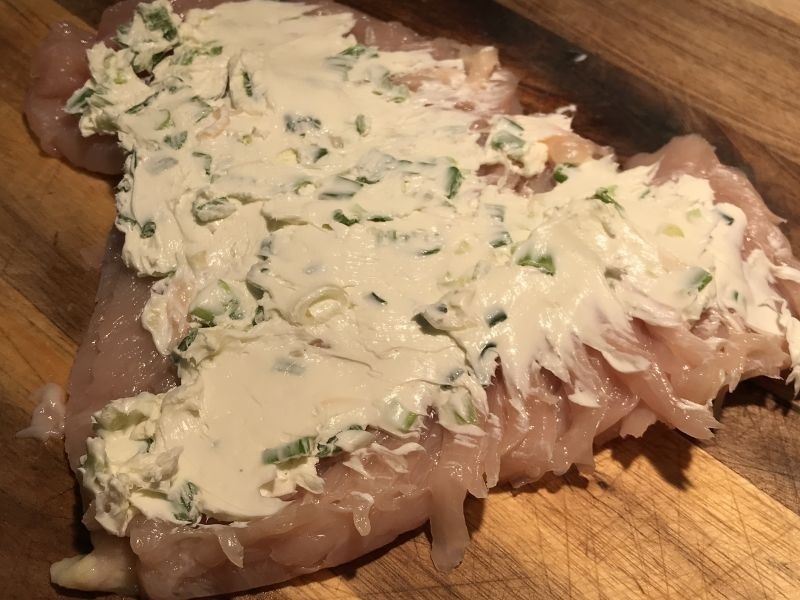 and spread each chicken breast with this filling. 10. 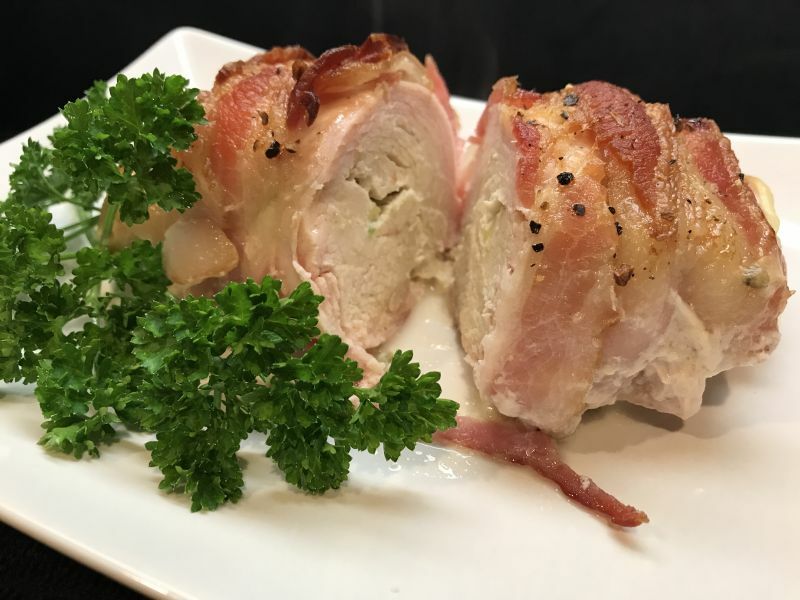 Roll the chicken breasts with the filling inside, much like you would a cinnamon roll. 11. 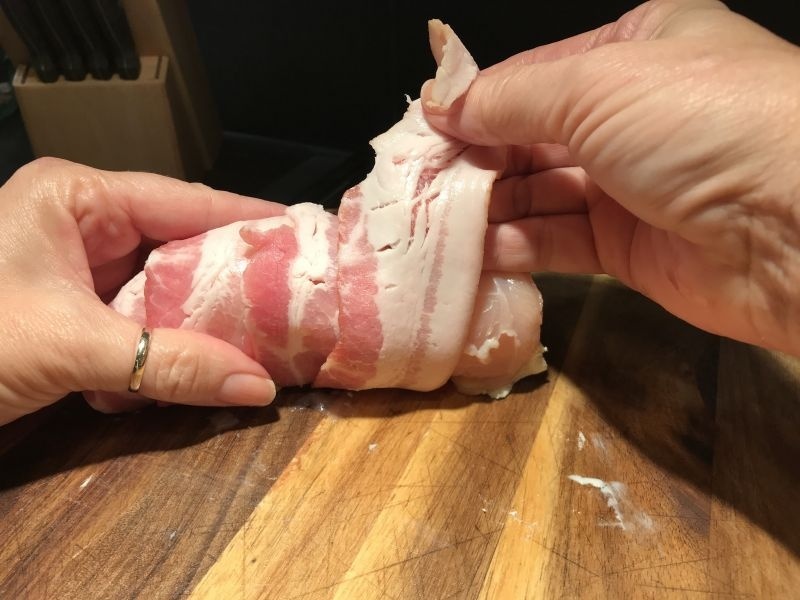 Wrap each of these chicken rolls with 2 slices of bacon, attempting to cover the ends as best you can. Secure with 2 toothpicks. 12. Place in a prepared casserole dish and bake for 1 hour. Some of the filling and juices will run out into the casserole dish. It is fabulous, so don’t throw it out! 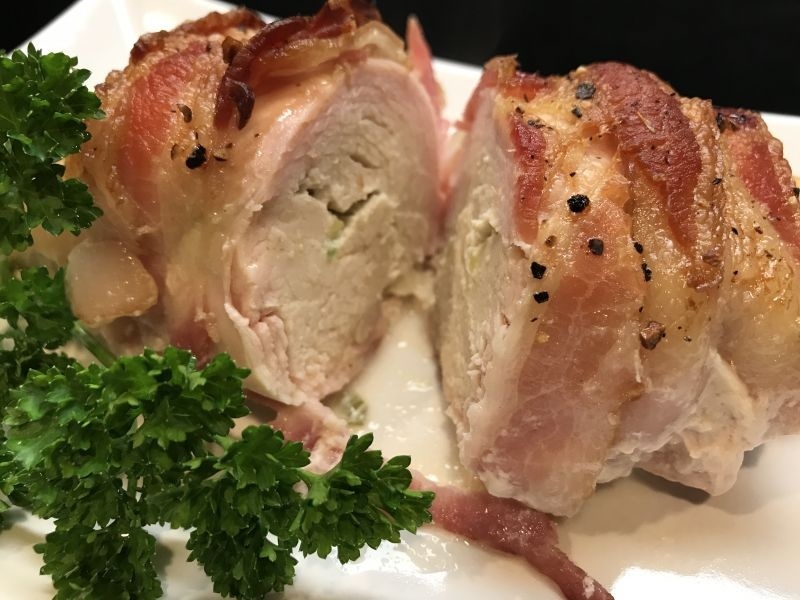 Drizzle some of the sauce over these amazing chicken and bacon bundles, or just put it in a gravy boat and serve alongside them so your guests can decide for themselves. Amber comments: For this week’s pairing I selected 2016 White Knight Viognier. Its light clean flavor layered with notes of peaches, melon and a hint of flowers made it a great choice at only $9.99. For my full review of the 2014 vintage, click here. Thank you! I especially enjoy it with the “drippings” drizzled over it! I hope you enjoy it as well! Yum! And a great recipe for a busy week night. Thanks for sharing, April! Thank you! It’s cerrainly fast and easy for a weeknight! And you can make it ahead on a Sunday, place in the refrigerator and bake after work on Monday! I hope you enjoy! I can attest to the awesomeness that is this chicken! I’m looking forward to a future recipe I got to sample, too!!! Thank you for your comment! I’m glad you enjoyed it! Thanks everyone! I hope you enjoy!